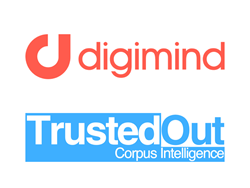 Digimind, a global leader in Social Listening and Market Intelligence software, and TrustedOut, the inventor of Corpus Intelligence, announced a strategic partnership today. Their goal is to provide business intelligence analysts, brand safety managers and PR professionals with a super-profiled, trustworthy corpus of sources. "We are extremely proud to partner with Digimind. Digimind’s mission to help their customers understand the world as it is, is a perfect fit with TrustedOut’s mission to make Corpus Intelligence smarter and trustworthy” said Freddy Mini, co-founder and CEO of TrustedOut. TrustedOut introduces “Corpus Intelligence” to make Intelligence trustworthy, allowing our clients to precisely define what they trust with a uniquely profiled, AI-fed and permanently updated media database. TrustedOut will be in production in Q2 2019. Learn more at http://www.trustedout.com.